The Atlas Copco LTP 3 submersible pump rental is available in Rochester NY, Ithaca NY and Upstate NY from the Duke Company. A spark proof motor is an important safety measure when pumping contaminated fluids. The LTP3 is equipped with a ten metre discharge hose and quick-release couplings. up to 2 ½ inches in diameter. Hydraulic pumps offer a greater degree of reliability. The Atlas Copco LTP 3 submersible pumps are used in a wide range of applications. They are great at continuous pumping of clean or contaminated water; as well as flooded excavations and cellars. The pumps are driven by a built-in hydraulic motor, designed with a special drive shaft, seal and bearings. They are cooled and lubricated by the hydraulic oil and can be left to run dry without damage. Hydraulic pump performance is impressive relative to their size and weight. They provide heads of 82 – 105 ft and outputs of 222 – 507 gal/min. 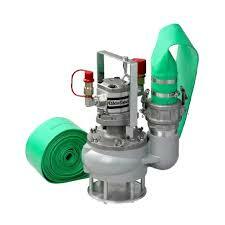 It’s an ideal all-round pump for municipalities, rescue services , water and waste utilities. Other uses include general construction and road services/maintenance work.